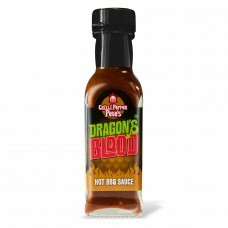 What can we say about the legend that is Chillipepperpete's Dragon's Blood Hot BBQ Sauce? Hot, sweet, smoky and sticky - a perfectly balanced rich sauce or marinade and vital ingredient for any BBQ dish - chicken wings, ribs - or mix with sour cream for a delicious smoky topping for baked potatoes. Using chipotle morita chillies and some clever spicing, this is one for camping out and eating in. Hot sauce just got smokier! Ingredients: Chipotle peppers, Tomato, Cranberry Juice, Blackcurrant Juice, Brown Sugar, Vinegar, Lemon Juice, Garlic, Salt, Spices, Soy Sauce.